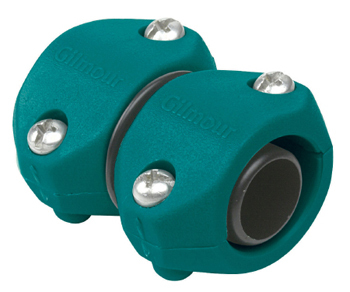 Save the cost of a new hose with Gilmour couplings. Premium construction for maximum strength and durability. Patented impact resistant clamp design. Non-corroding high grade stainless steel screws will not strip when tightened. Manufactured using highest level of quality control. Leakproof, rustproof, unbreakable, reusable and easy-to-use. For rubber or plastic hose. For use with all 5/8" and 3/4" hoses. Poly.